James Otis Crandall was born October 8th, 1887 in Wadena, Indiana. 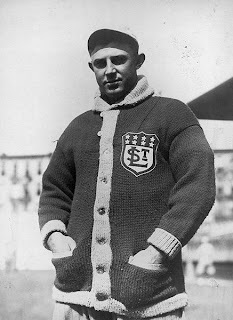 He was signed by the New York Giants in 1908 & became one of the first pitchers to be used primarily in Relief. He earned the nickname "Doc" because he was able to recuperate sick Giants games. Team mate Damon Runyon said he was "the physician of the pitching emergency." 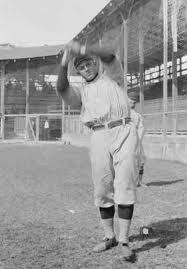 In his first season in New York he went 12-12 third on the Giants staff behind Christy Mathewson (37 wins) & Hooks Wiltse (23 wins) posting a a 2.93 ERA. Over the next five seasons he would close out & finish the most games in the league each year. 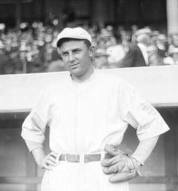 Crandall also led the league in reief wins from 1910-1912 in pennant years with the Giants. 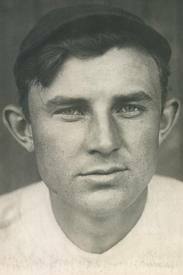 In 1910 he won a career high 17 games (17-4) with an .810 winning % while posting a 2.56 ERA. The Giants would win N.L. Pennants three straight seasons from 1911-1913, losing in the World Series twice to Connie Mack's Philadelphia Athletics & once to the Boston Red Sox. On the 1911 squad Crandall was third on the teams in wins behind Mathewson (26) & Rube Marquard (24). His 2.63 ERA was also third best to the same two pitchers & his five saves were second best in the league, although the stat was nor kept tract of in those days. 1911 World Series: In the 1911 World Series Crandall first appeared in Game #2 at Philadelphia pitching in relief of Rube Marquard in the 3-1 Giants loss. In Game #5 at the Polo Grounds Crandall came in relief of pitcher Red Ames in the 8th inning with the Giants behind 3-1. In the bottom of the 8th he doubled & then scored the tying run on Josh Devore's extra base hit. Crandall earned the victory as he pitched through the 10th inning. In the bottom of the frame Fred Merkle won the game with an RBI sac fly. In 1912 Crandall once again won double figures going 13-7 with a team leading 1.69 ERA. He made ten starts in 37 games finishing 25 (best in the NL) & posting two saves. This year he was the Giants fourth best pitcher behind Mathewson (23-12) Marquard (26-11) & Jeff Tesreau (17-7). 1912 World Series: In the World Series against the Boston Red Sox he appeared in just one game pitching two scoreless innings. In 1913 he was sent to the St Lois Cardinals but upon hearing the news at the Polo Grounds the fans went crazy & there was a huge public outcry. He was immediately sent back to the Giants where he went 4-4 with six saves (second in the NL) & a 2.86 ERA finishing off a league best 27 games. Crandall was also a good fielder posting a perfect .1000 fielding % and also played two games at second base. 1913 World Series: In the World Series he appeared in four games, two games as a pitcher, finishing off the Giants Game #3 loss. Overall he pitched in four innings allowing two earned runs. He also appeared in two more games as a pinch hitter going 0-4 overall. 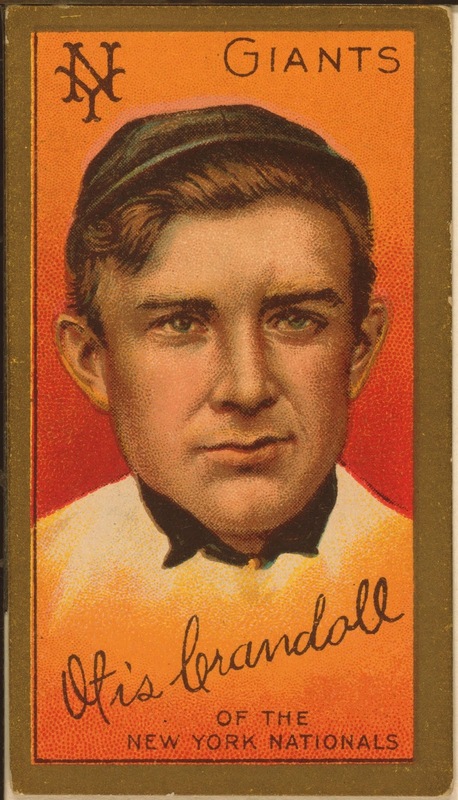 As a hitter Crandall hit over .300 four times in his ten year career. 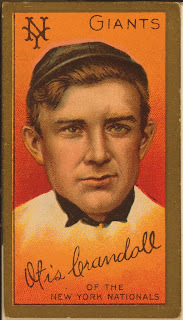 He also hit a HR in every season from 1908 through 1911, driving in a a career high 21 runs that season. In his batting career he hit .286 with 253 hits 9 HRs 35 doubles 19 triples &126 RBIs with a .375 on base %. In 1914 he went over to the Federal League playing for the St. Louis Terriers, not only did he pitch but was also the teams second baseman. He was one of the last players to pitch & hold another position. In 1915 he won twenty games going 21-15 with a 2.59 ERA. In his ten year MLB pitching career he was 102-62 with a .622 win loss % (71st best all time) with a 2.92 ERA, 606 strike outs 379 walks in 1546 innings. In 302 games he finished 146 games, posted 25 saves & made 134 starts. Passing: Crandall passed away in Bell, California in 1951 at age 63.